Meet Jamie and Mary your mountain biking guides and creators of Ride The Alps. Jamie has been riding mountain bikes for over 30 years and 2019 is his 27th year of guiding mountain bike trips all over the world. Jamie’s vast experience means that he knows what can turn a good trip into a fantastic trip. Jamie’s career in mountain biking began as the youngest member of the first British mountain bike racing team in 1987. Following 4 years of professional racing in 1992 Jamie took on possibly his most grueling challenge when he participated in the world’s longest mountain bike race. The route was from coast to coast across the dry, dusty interior of Australia – a hot 3,330 miles in one month. Since then Jamie has been traveling independently, exploring the world’s remotest places on his bike including 3,200 miles from Beijing to Kathmandu across the desolate heights of the Tibetan Plateau. Jamie has also worked for Exodus and KE Adventure Travel during which time he has guided a range of bike trips in Ecuador, Nepal, Tibet, India, Guatemala, Costa Rica and Outer Mongolia. Personal adventures to Canada, Alaska and New Zealand make Jamie one of the UK’s most widely traveled and experienced mountain bikers. Following his adventurous spirit, Jamie found the best biking area in Europe in which to establish Ride the Alps. 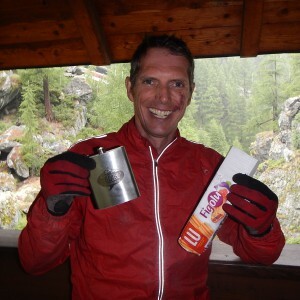 Adding to his mountain guiding experience in 2004 Jamie gained his International Mountain Leader award. This is a professional qualification which ensures that Jamie and Ride the Alps are insured and have the skills and expertise to keep you safe. Jamie is now one of the select few British guides working in the French Alps who has IML and British Mountain Bike Leader qualifications. My own bright green Orange Alpine 160 and my On One “fatty”. It begins on top of the magnificent Col d’Anterne with gob-smacking views of Mt Blanc in the distance. At first the trail is a little off-camber but not too steep. There are multiple fun lines to be had, great little jumps and line choices. The back drop is an impressive wall of rock that is the vertical side of the Pointe d’Anterne and the Tete a l’Ane. A short hard section follows and it’s much steeper for a while. The trail is narrow with a big drop on the right, as you negotiate some tricky corners and drops down to the easy bit by the Lac d’Anterne. A short push up a grassy section brings you to the Petit Col d’Anterne. From here there is a short traverse that brings you to a fast flowing section down a gully-like track, with multiple drops. It’s a great fun flat out blast. An easy, fast double track blast brings you back to Sixt before a cruise along the valley trail back to Samoens. A cool vertical mile descended right into our valley from the water shed to the Chamonix valley. This is always a favourite with guests riding our Alpine Singletrack trip. Now this is a hard one as I have so many to choose from, and so many more to discover, that often I say the last descent I have done or the one I am doing is my favourite one! But I’ve picked a classic from our Alpine Enduro trip. It has a bit of everything: steep and technical to start with, stunning scenery , loads of switch backs and then a fast flat out blast to finish. 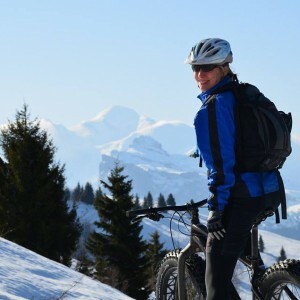 Mary runs the business side of Ride the Alps and will normally be your first point of contact for any trip. Whilst she is not involved with the guiding of the trips Mary is also a mountain bike enthusiast. She has ridden all of the Ride the Alps trips on offer and will be able to answer any questions you have regarding our holidays. 2019 is Mary’s 18th year of riding mountain bikes. “The Arete” black route down from Morillon 1100 back to our front door. Flowing singletrack for the top section with a smattering of rocks and roots, a fast blast along a ski piste and big swoop-up, then super-steep, belly on the saddle, twisting through the trees to the bottom. It’s the most bike fun you can have with only an hour to spare. The last day of riding on The Eiger tour. From the top of the spectacular Kleine Scheidegg above Grindelwald the trail winds away across high alpine meadows in the shadow of the North Face of the Eiger. The beauty of the place is breathtaking and the single track just keeps on flowing. Once you hit the tree line the trail becomes more technical as it twists and turns down through the forest. Perfect technical, rooty single track. I love it!